At Princeton, in addition to preparing for medical school, he was also a member of the choir, glee club and the Princeton Nassoons (an all male a cappella group). He went on to receive his MD degree at the University of Rochester while in the Navy V-12 program. Internship was at Yale New Haven Hospital during which time World War II ended. After the war, he remained on active duty in the Navy where he was assigned to the Veterans Administration Psychiatric Hospital in Canandaigua, NY. Following his 2 years of military service, he went through a pediatrics residency at the Childen’s Hospital of Buffalo. Neurology and Child Neurology training was with Sidney Carter at the Neurological Institute in New York. During this time, Kennedy and Carter published an article on optic neuritis in children and the risk for multiple sclerosis, a paper that spurned future research . 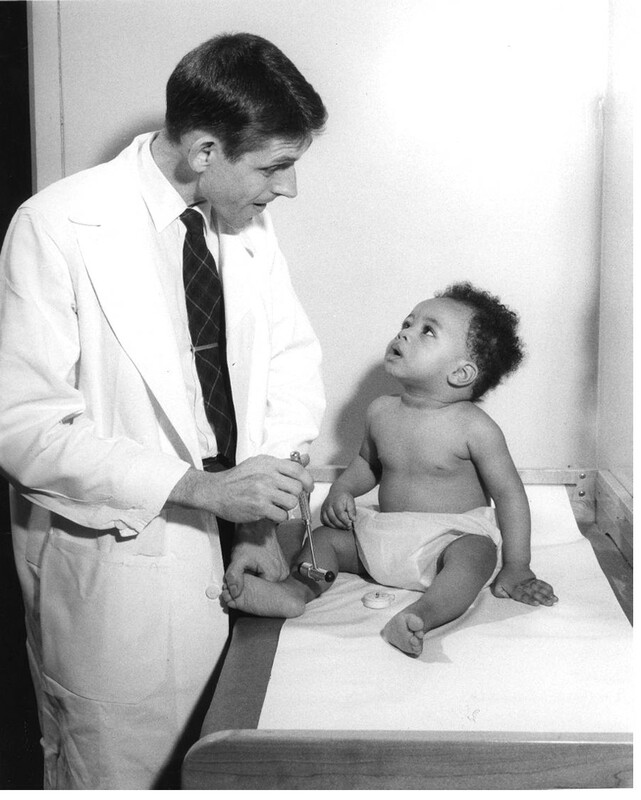 Following his fellowship, Charles was appointed Chief of Neurology at the Children’s Hospital of Philadelphia. Kennedy had a very strong interest in the cerebral blood flow and metabolic requirements of the developing brain. Very early in his career, he developed a close collaboration with Louis Sokoloff, also a physician scientist who never practiced medicine except during internship at Philadelphia General Hospital. As early as 1957, Kennedy et al. (J Clin Invest) used the Kety-Schmidt method (a modification of the Fick Principle) to show for the first time that children require higher cerebral blood flow and oxygen utilization than adults. In 1967, Kennedy took a sabbatical at the Laboratory of Cerebral Metabolism at the NIH, working with Louis Sokoloff. That sabbatical was a life changing event for Kennedy who decided not to return to his position in Philadelphia but to pursue his research collaboration with Sokoloff at the NIH. He split his time between NIH and Georgetown University School of Medicine, where he was Professor and Chief of Child Neurology. The following years were highly productive and scientifically rewarding. Sokoloff and Kennedy became life-long friends and colleagues; they complemented each other with their skills. A series of experiments investigated the use of various carbon-14 labeled radiotracers and quantitative autoradiography to measure cerebral blood flow. In 1977, Sokoloff, Reivich , Kennedy and the group published the seminal paper in Journal of Neurochemistry on the 14C-2-deoxyglucose method for the measurement of local cerebral glucose utilization in the rat brain. This method has been widely used in various experimental paradigms in a number of species. Importantly, the method provides the basis for the measurement of glucose metabolism in humans using positron emission tomography (PET), which is now routinely used in the clinical setting. Citations: Sokoloff L, Reivich M, Kennedy C, Des Rosiers MH, Patlak CS, Pettigrew KD et al. (1977) The [14C]deoxyglucose method for the measurement of local cerebral glucose utilization: theory, procedure, and normal values in the conscious and anesthetized albino rat.J Neurochem 28 (5):897-916. PMID: 864466. Dr. Harry Chugani is currently Division Chief of Neurology at Nemours Biomedical Research, a division of The Nemours Foundation, University of Delaware. He was also President of the ICNA from 2010-2014.